He wrote the achingly honest “Fource” that day, recording a panic attack-induced stream of consciousness, layered above crunches of twigs and leaves beneath his sneakers. The rest of It Kindly Stopped for Me follows this minimalist approach, employing piano and infrequent acoustic guitar alongside Boucher’s whisper, while retaining Sorority Noise’s essence: motifs of impermanence and suicide that guided their sophomore full-length, 2015’s Joy, Departed. Such themes inspired them to headline this year’s inaugural benefit for Punk Talks, an organization that provides free mental health assistance to those involved in music. It’s hard to imagine the relatively quiet It Kindly Stopped for Me coming from the same band who initially formed two years ago. Their current lineup — Boucher, Adam Ackerman (guitar, piano, vocals), Ryan McKenna (bass, vocals), and Charlie Singer (drums) — made their debut via an impromptu Rage Against the Machine cover set for that year’s Fest in Florida. 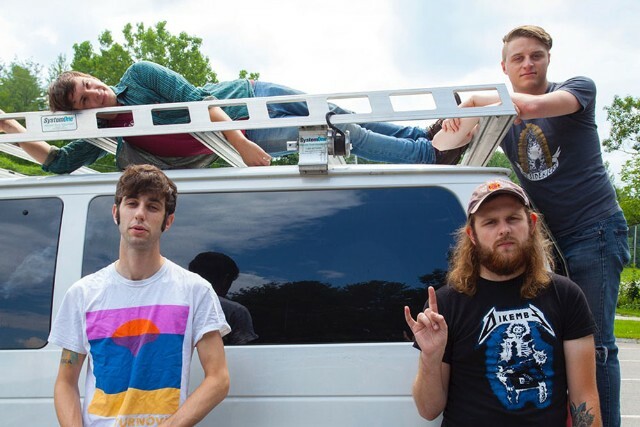 While balancing undergrad studies at University of Hartford and Worcester Polytechnic Institute with Sorority Noise — some of the members are also in indie upstarts like Prawn, Old Gray, and Small Circle — the band began to host their own house shows, calling the DIY spot Nicolas’ Cage. In line with the group’s never-resting spirit, Boucher also produces for bands — he co-owns a recording studio with Jake Ewald and Ian Farmer of Modern Baseball — and explains that It Kindly Stopped for Me was done “all in-house,” having mixed and mastered it himself. Now, ahead of the release, Boucher sits down to discuss mental health, shutting his eyes onstage, and the varied tunes Sorority Noise jams to on the road. It Kindly Stopped for Me is quieter and more poignant than your last release. What inspired this shift in tone? I had a lot of friends pass away this summer. All of the songs are essentially about one of them. He was the most beautiful beam of energy and such a positive person. I was always struggling with depression, and he knew that and would help me. Then I found out that he took his life without leaving a note or anything. So I’ve been thinking a lot about how fleeting life is and how I don’t have any answers to life as I attempt to figure myself out. I wish that I could extend a feeling or a conversation to the people who I lost before I lost them. These songs [are] more quiet because, for the first time in most of my life, they actually didn’t make sense to be louder. It wasn’t easy to write and they’re not super fun to play either, but they were songs I needed to write. The song “Fource” sounds like you’re walking in the woods, talking to no one in particular. Sometimes when I have a melody but no guitar near me, I’ll just open my voice notes and sing exactly what’s on my mind. I think that freestyling a song is how you’re gonna get the most honest lyrics, rather than waiting for something to come and then putting it down to paper. Someone called it spoken-word, but it’s literally just me having a panic attack and making things up on the spot. What are you referring to in the title, It Kindly Stopped for Me? There’s an Emily Dickinson poem [that starts], “Because I could not stop for death, [He] kindly stopped for me.” I think [this is] the first thing I’ve done in a while that wasn’t about a relationship with a significant other; most of the songs center around the concept of loss. My friends met me where they left off, and in lieu of me taking my own life, I unfortunately lost others. But because I did not care for my own particular loss anymore, it stopped for me. Is the next release going to be as solemn as this EP, or will it revert back to your Joy, Departed sound? Some of the lyrics we’ve been writing are an amalgamation of our two most recent records, but it’s all full-band and pretty loud. I’m really into using my instrument as more than just an instrument lately; I like to scream into the pickup, and we’re trying to bend guitars and make them do things that they’re not supposed to do. I’m excited for the new stuff, but I don’t see it coming out for a good amount of time. A lot of the bands’ lyrics are about mental health issues, and Sorority Noise played the first Punk Talks benefit. How did you get involved? [Organization founder] Sheridan Allen was running a thing that I related to, so she hit us up and we were like, “Yeah, let’s do it.” The band has been really great about my episodes and anxiety attacks, so I think that we’re all very in on trying to help other people in knowing that they’re not as alone. I try to bring up mental illness [every show we play]. When I was going to shows, I was feeling very alone in my head, and I like to tell people that if you’re going through it, you’re not alone. It’s obviously not the focus of the band, just a habit of my and our existence. Have you played anything from the EP on tour so far? Yeah, we played the song “Either Way.” The other songs are kind of hard to translate because we haven’t worked them out full-band yet. Most of these songs were born in my bedroom during Thanksgiving break at my parents’ house. I think the point of the 7-inch is to do something different that you wouldn’t do on an LP. When I write an LP, I like to put a lot of focus into one concept and make it all very cohesive. But some things I would like to do wouldn’t make sense on a record, so it’s very cool to be able to do them in a 7-inch. I close my eyes during every set we play, so I honestly don’t take in much crowd reaction. I like to not discriminate [between] shows, because sometimes there are, like, four people coming to see you. I don’t wanna look out and think anything different than what is actually being reflected in the songs I’m playing, and I want to be the same person I am every night. So I don’t want to have to take into account that maybe some people don’t give a s**t.
What do you usually listen to on the road? I drive all the time, so I get to pick the music most of the time. Today, we got into metalcore; I think we listened to an Attack Attack! song and a Four Year Strong song. I checked out that new Into It. Over It. record on the drive this morning and it was really incredible. We listened to some Coltrane today. Actually, we were just listening to Pharoah Sanders, he’s one of my favorite jazz musicians, and Chet Baker. But we also listened to the Dropkick Murphys, so we’re pretty all over the place. We listen to The Black Parade by My Chemical Romance a lot, it’s a really good album. I dyed my hair white in eighth grade cause I was a huge Gerard Way fan. Oh yeah. [Laughs.] That’s commitment.